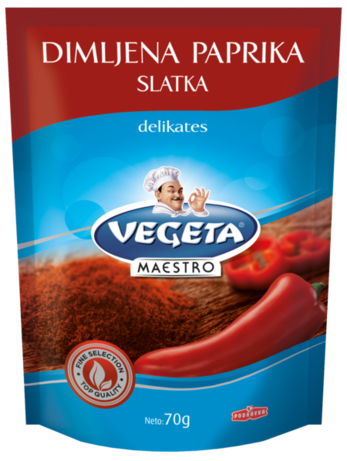 Podravka delikates mild smoked paprika is produced by smoking over the natural smoke of oak wood, and contains no added flavouring. Smoked mild paprika gives a special sweet smoke flavour. It can be used to marinate meats before baking or grilling, or to season meat soups, stews or sauces. It is traditionally used as a secret ingredient in paella and other Spanish dishes. smoked mild paprika gives a special sweet smoke flavour. It can be used to marinate meats before baking or grilling, or to season meat soups, stews or sauces. It is traditionally used as a secret ingredient in paella and other Spanish dishes. Storage: keep in dry place.